A big-hearted plumber’s random act of kindness made a lonely grandmother’s day when he brought her a giant bouquet of flowers to cheer her up. Generous Andy Sullivan, 40, was working on a terraced house when he looked across the street to see 89-year-old Betty Dixon sitting on her doorstep looking forlorn. Father-of-one Andy took it on himself to cheer the dementia sufferer up – and brought her a bouquet of flowers. The kind-hearted gesture has now gone viral after Betty’s daughter thanked him for making her mother’s day on Facebook. He said: “I was just digging opposite and I overheard a discussion with a male family member, with her saying it was a big house and she was knocking about in it alone – she just looked really sad. “I was watching her for about an hour and she just looked like she was trying to find something to do or look at. Facebook post praising Andy Sullivan. 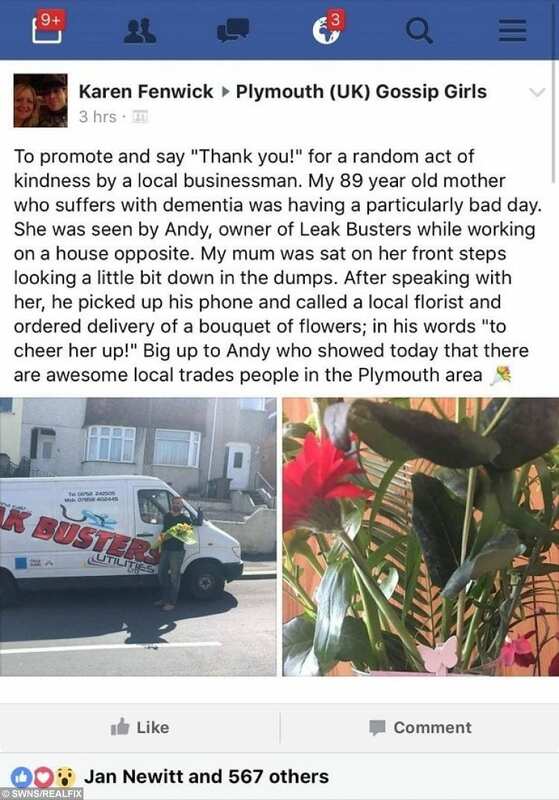 Andy, who owns plumbing business Leak Busters in Plymouth, Devon, added: “I’ve always respected my elders. I think the elderly get a bit forgotten and are left to just get on with it. “Abroad they are put on a pedestal and treated like royalty, but often here it’s a different story. Betty’s daughter Karen Fenwick shared the tale with a picture of Andy on Facebook and it now been shared thousands of times around the world. Karen, 54, said: “He deserves recognition. Something like this doesn’t happen everyday. It was so heart-warming. “He didn’t even know my mother and said he simply did it for no other reason but to cheer her up. “Because of her age and her dementia I think she was a bit confused what was going on at first but it made her day. Andy said the respect he has for women stems from his own mother, who was a single parent and brought him and his siblings up to consider others. 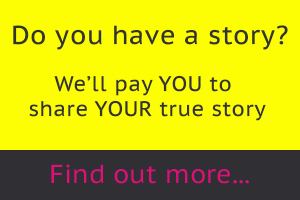 He added: “It felt great to help. Next article » Young Entrepreneur Fills Office With Giant Ball Pit, Takes Staff To Vegas And Gives Out Limitless Holidays!